Psychology majors at St. Mary’s benefit from small classes, personal advising and faculty recognized for their teaching. 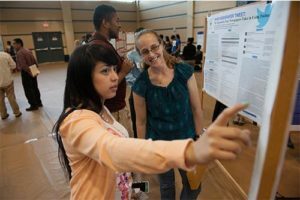 Students also design their own social science research and present their findings at research conferences. Students of all majors may take Psychology courses to fulfill the requirements of the Core Curriculum. Many career options exist for Psychology majors such as careers within the social services arena such as a rehabilitation specialist, psychiatric technician, career counselor, case manager, and much more. This major also prepares students interested in pursuing a graduate degree. At St. Mary’s we know how important it is for our students to gain hands on experience in their field of interest, which is why we make field placement opportunities available to Psychology majors. Field placement provides Psychology majors with opportunities to learn about the practice of psychology in supervised settings outside the classroom. Placement sites include schools, hospitals, nonprofit organizations and numerous social service settings throughout the San Antonio area. To view a list of the projected course sequence schedule, email jpierucci@stmarytx.edu. For more information about PLLC, contact Jillian Pierucci, Ph.D., at 210-431-2019 or jpierucci@stmarytx.edu.